This Wii-exclusive, multiplayer game uses a board game base as mini-games, rewarded with mini-stars, spread across the landscape for all-ages fun. Mario returns with multiplayer modes for up to four players as Bowser hoards mini-stars, the game’s main currency. 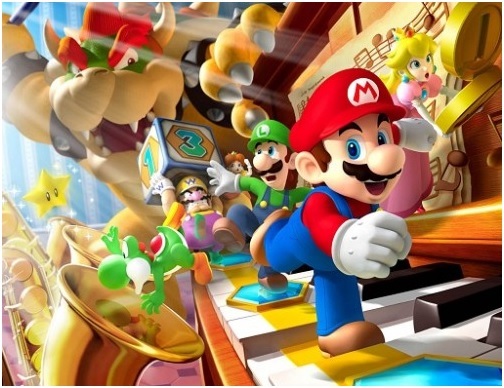 Of course, Mario and company decide to get them back in a civilized way…by playing a board game with fun vehicles containing all players and free-flowing mini-games all in entertaining environments and settings. Bowser is definitely in control here, but not particularly menacing as his assisting son, Bowser Jr. helps offset possible fears from very young players. My daughter named Bowser’s roars and knowing he was “getting ready to something bad” as her biggest stresses. 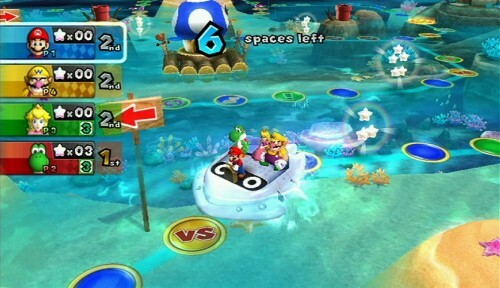 Mario Party 9 contains more than 80 mini-games – 44 in Free-For-All, 14 boss battles, ten 1-VS.-3, ten involving Bowser Jr. and two extra mini-games. Ideally players should experience all the mini games for a definite advantage in the Solo and Party modes. Characters (appearing in Solo and Party modes) include Luigi, Wario, Daisy, Peach, Waluigi, Toad, and Yoshi plus new characters like Koopa with two unlockable characters Shy Guy and Magikoopa/Kamek (complete the beginning story mode to get him). All the players progress on the board inside a vehicle, which improves the speed, ease-of-play, and overall format. No need for movements just button pressing as each player takes turn making decision as captain during his/her turn. The goofy actions, unpredictable consequences and win/lose reactions entertain while making events clear at all times (combined with large font text messages). Player use dice blocks for progressing and can even win dice blocks by landing on specific spaces. Except for the basic block numbered one through six, dice block types are used only once and vary in number range, speed, etc. Each game board also features boss battles in the middle and end that involve all active players. Boss battles sometimes have players working together even as they compete against each other. 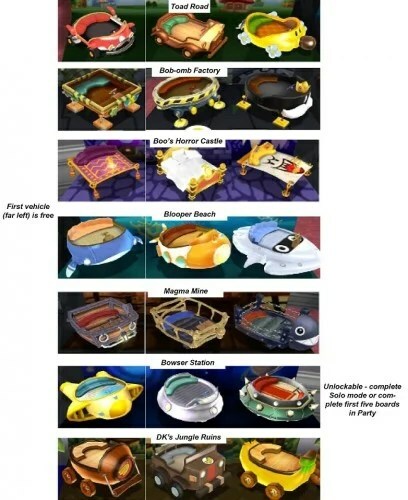 Special Bowser spaces include a choice or some or a lot. These randomly placed spaces can entice players to choose lot if they’re behind or some if they’re ahead for a conservative strategy. Players spin for Bowser spaces events, largely consequences, which cost players mini-stars or redistribute mini-stars. 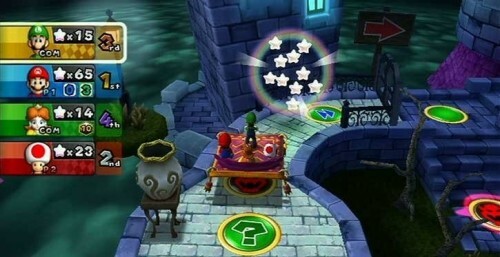 The board stage ending triggers a summary event where each player’s mini-stars are converted into Party Points used to buy new constellations (more than 50 for 50 PP each), difficulties, sounds (including character voices), stages, and vehicles (see above graphic) in the Museum mode. The controls are almost always very simple and intuitive while including sideways orientation of the remote. More motion based actions would have boosted the intuitive play even more. The difficulty and leveling options provide customization for an equal playing field without player squabbles and overall frustration. Multiple difficulty levels let players customize the challenge, such as allowing younger players to start the game with more mini-stars than their opponents to help even out skill discrepancies. The fun antics include vehicle movements on the board and the free moving mini-games. Coordinated jumps, vine tugging, interactive environment elements, cannon firing, falls, and races all provide well varied, highly entertaining game variety. Players can also jump on other player’s heads to get those hard-to-reach items. As fun to play as it is to watch and a worthy installment in the Mario Party game series. This entry was posted in Video Game Reviews and tagged Mario, Michael Siebenaler, Mike Siebenaler, Nintendo, Tall Writer, video games. Bookmark the permalink.